It is rare to find a winery and a distillery located in the same vineyard. It is extremely rare to find that this winery is producing chardonnay that is then transformed into cognac by the distillery. But this is exactly what is happening at the Darling Park vineyard on the Mornington Peninsula. In this wine making region, the Darling Park winery and the Bass & Flinders Distillery have an unorthodox, but very innovative relationship. Judy Gifford is the winemaker. A former biochemist, she studied wine making at the University of Burgundy in France. She is an admired and respected member of the Red Hill community, and in a profession dominated by male winemakers, she has become the general manager of the of the Darling Park vineyard. Judy is responsible for a range of wines produced at the vineyard, including chardonnay, pinot noir, pinot gris, shiraz, and sauvignon blanc. But it is the chardonnay that is the basis of the relationship with the distillery as it is a base wine for the cognac. Bob Laing and Wayne Klintworth are the distillers. They are neighbours who together decided to do things differently. Instead of making vodka and gin from potatoes and grains, the way it is made in Russia and Poland, they wanted to make them from grapes. Chardonnay, which they source from different vineyards, was considered the wine most suitable to undergo the conversion into spirits. 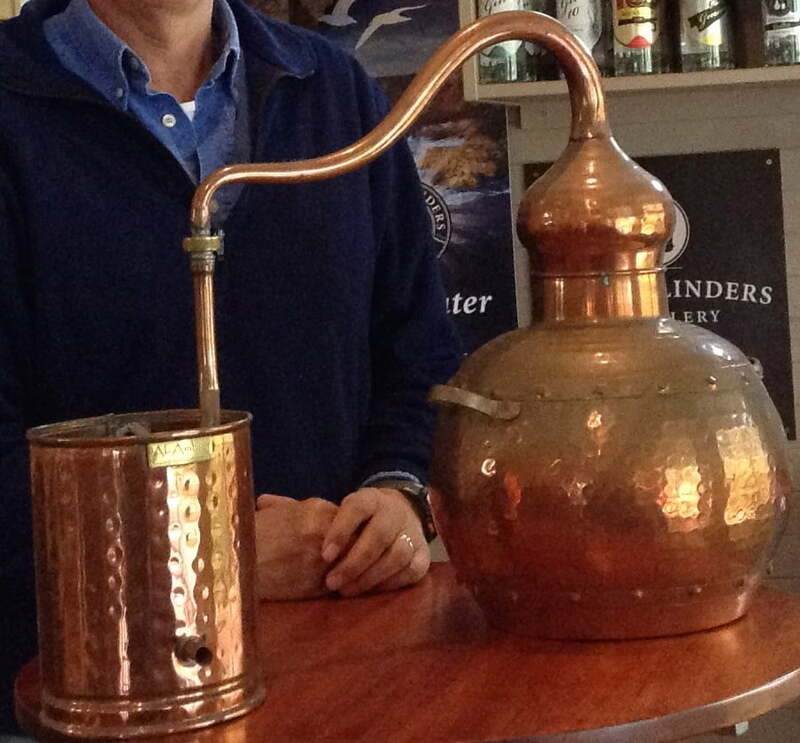 They sought mentors internationally, and then set up their Alembic copper still in Darling Park. These copper stills date back to the Egyptians in 800AD, and were used over the ages to concoct not only alcohol, but also medicines and perfume. Alchemists even used the alembic still in their attempts to magically convert base metals into gold. And there is something magical about the process of turning wine into spirits. The grapes are crushed and fermented into wine which is heated until it is vaporised. The vapour is then chilled to condense into liquid and flows out as spirits. You can taste the wines and spirits at the Cellar Doors of both the Darling Park winery and the Bass & Flinders Distillery, and stroll through the pretty vineyard that surrounds them both.